Seal took another dish and placed it near the fire. Then he held up both his hands close to the fire…so that they grew warm, and oil dripped from his fingers and ran into the dish, which he gave Txämsem to dip the salmon into. Txämsem dipped his salmon into the oil and ate. Seal meat and fat are highly important foods, and their oil is used to preserve berries and as a condiment for eating dried fish. Seals were traditionally killed from canoes using long spears with barbed heads. 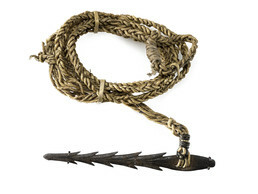 This spear head, which is attached to a piece of braided seaweed line, was forged from an iron trade file. Faint parallel lines from the file can still be seen.